Rim, Font 1.60 x 21"
Wheelbsase 1484 mm / 58.4 in. 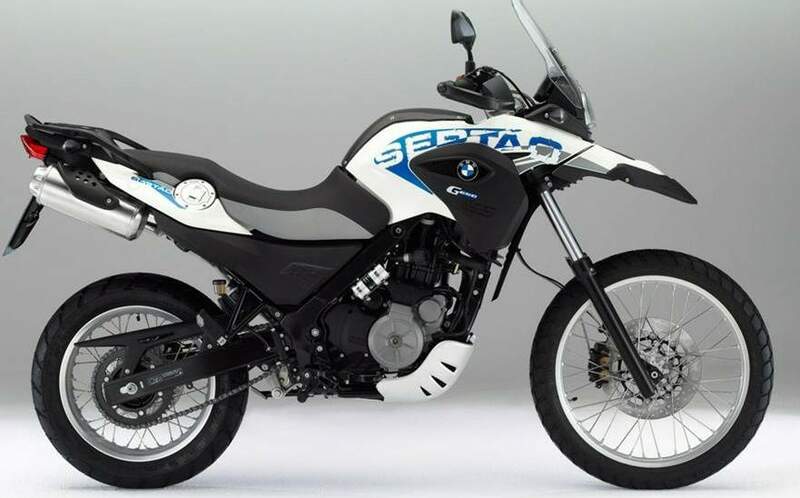 BMW is adding a more off-road oriented sister to their single-cylinder G650GS, named the G650GS Sertão. Portuguese for “wilderness,” the Sertão uses the same 652 cc liquid-cooled and counter-balanced single cylinder engine as the standard G650GS — producing 48 hp at 6500 rpm and 44 ft-lbs of torque at 5000 rpm — but the chassis and accessories have been updated to provide more off-road ability without sacrificing on-road comfort. The differences includes longer travel springs and wire spoke wheels. Up front, the 41mm diameter forks now travel up to 8.3″ (up from 6.7″) with the rear swingarm capable of the same (8.3″ up from 6.5″). The 19″ cast alloy front rim has been replaced with a larger 21″ wire spoke rim with a narrower rear wire rim, 3.00 x 17″, than the 3.50 x 17″ alloy on the standard G650GS. The tubed tires are 90/90 R21 54S in front and 130/80 R17 65S in back. The longer travel suspension gives the Sertão more ground clearance but also higher seat heights. The standard seat is now up 2.4″ to 33.9″ with a 35.4″ bench as an option. The Sertão comes in Aura white/Arroyo blue color scheme with prominent “Sertão” lettering. Most of the engine and other components are painted black with a few Nürburg silver elements such as the alternator and clutch covers. Several off-road ready accessories are standard on the Sertão including: aluminum engine guard, high windscreen, hand protectors, and extended front wheel mud guard. 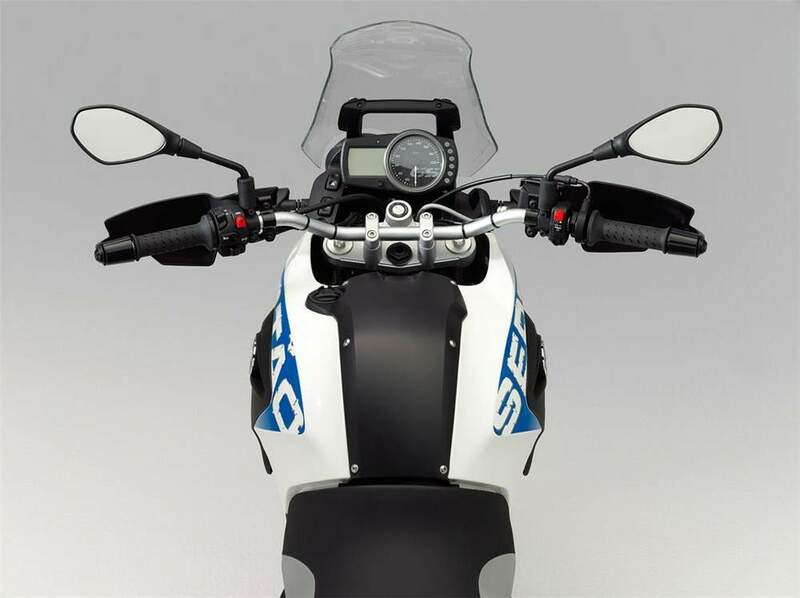 Dealer options include BMW Motorrad ABS which can be turned off (likely standard in the U.S.), heated grips, Vario saddlebags, topcase, tinted high windscreen, crash bars and the taller seat mentioned previously. 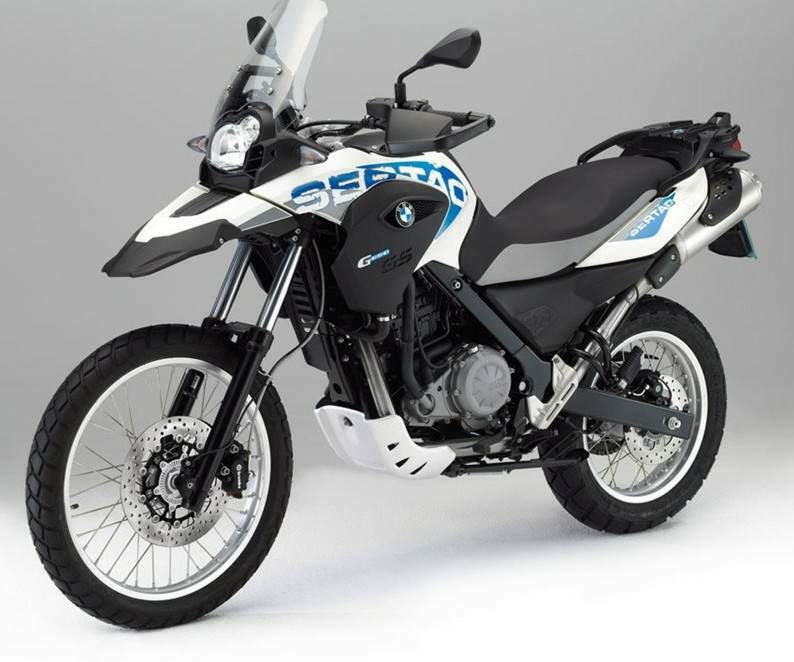 BMW G650GS Sertão – the sporty BMW single cylinder enduro for offroad and everyday. 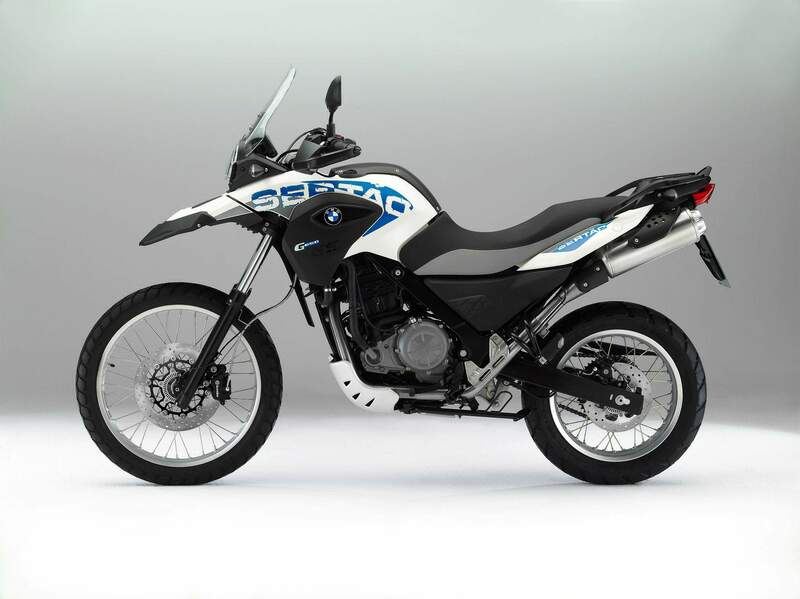 With its new BMW G650GS Sertão, BMW Motorrad has added a new, sporting chapter to the history of single cylinders in the BMW GS family. Whereas the G650GS thrilled riders with its lean, wiry offroad stature, the G650GS Sertão promises even more sporting characteristics, even greater offroad capabilities, and an even stronger desire for adventure. And all of this without any sacrifice to the established virtues of a BMW single cylinder endure such as everyday practicality, appealing price-performance ratio, and playful riding properties. Chassis for greater offroad practicality, optimized touring properties, and dynamic design. On the technical side, the new G650GS Sertão uses the established liquid cooled, high-torque single cylinder engine of the G650GS with two overhead camshafts, fuel injection, and double ignition. Its 652 cc displacement delivers (48 hp) at 6500 rpm and a max torque of 60 Nm [44 ft-lbs] at 5000 rpm. Options include output reduction to 25 kW (34 hp) at 6500 rpm and 47 Nm [35 ft-lbs] torque at 4500 rpm. Whereas the G650GS chassis was developed primarily for country roads and light offroad use, the Sertão presents far greater offroad practicality in the form of longer spring travels and tighter tuning. In addition, it is fitted with wire spoke wheels. Also the new color concept underscores the dynamic character of the single cylinder enduro. High-torque and low-consumption single cylinder engine with 652 cc displacement. Max torque of 60 Nm [44 ft-lbs] at 5000 rpm and max output of 35 kW (48 hp) at 6500 rpm. Output reduction to 25 kW (34 hp) available. Offroad chassis concept with long spring travels (front/rear 210 mm). Wire spoke wheels with light alloy rims. Wheel sizes 21″ front and 17″ rear. Dynamic colour concept in Aura White / Arroyo Blue with Sertão lettering and seat in black/grey. Extended top front wheel cover. Two seat heights: 860 mm [33.9"] (standard) and 900 mm [35.4"] (special accessory). Disengageable BMW Motorrad ABS (option ex works). Extensive range of special accessories. Sertão is Portuguese for hinterlands or back country, particularly the arid badlands of northeastern Brazil, the sort of place the new offroad-ready G 650 GS Sertão is designed to explore. From 2000-2010, the rock-hopping variant of BMW’s F 650 GS was called the Dakar, after the legendary rally that ran from Europe to the capital of Senegal, honoring Richard Sainct’s back-to-back wins on a BMW F 650 RR in 1999 and 2000. Security concerns in Western Africa forced the cancellation of the Dakar in 2008; it was moved to South America in 2009, where it has been run since. Although it now takes place in a different hemisphere, the Dakar Rally has kept the same name and Bedouin logo. Perhaps because KTM has dominated the past 11 Dakar rallies, BMW opted for a new name for its taller, beefier G 650 GS while still giving a nod to South America, where the 2012 GS Trophy competition will be held. For several weeks last summer, I had a crush on the G 650 GS, swooning over its light weight, nimble handling and peppy, fuel-sipping 652cc single (Rider, November 2011). Partial to adventure motorcycles with offroad prowess that matches their styling, my heart throbbed again when the Sertão was unveiled. Its $800 premium over the base-model G 650 GS is money well-spent: spoked wheels and more suspension travel for better bump absorption, and a rugged front fender extension, taller windscreen, hand protectors and engine guard to defend body and bike from harm and the elements. 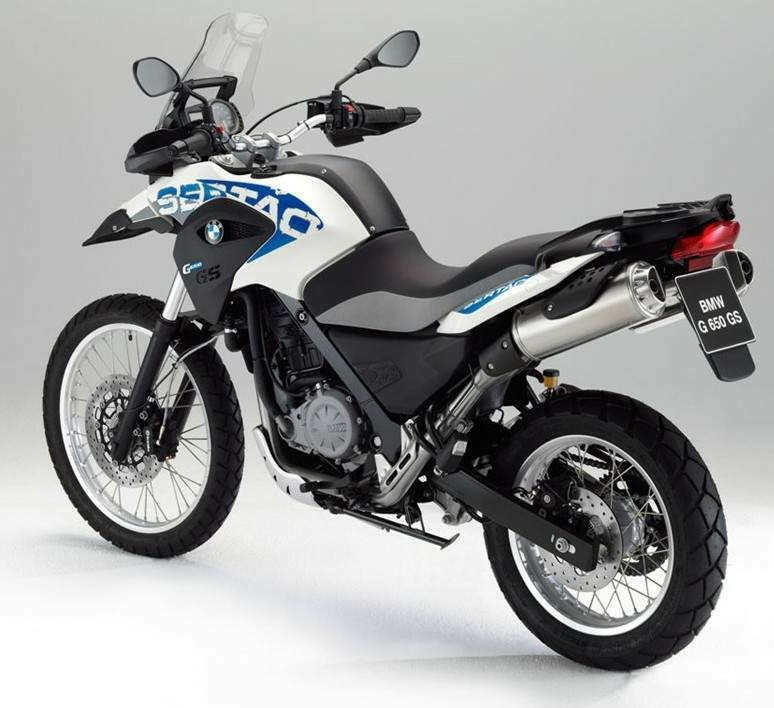 Compared to the regular G 650 GS, the Sertão’s larger diameter front wheel (21 vs. 19 inches) and different chassis geometry slows its steering somewhat. The Sertão’s 8.3 inches of front/rear suspension travel (up 1.6/1.8 inches) lessens rake (28.1 vs. 29.2 degrees), adds trail (4.8 vs. 4.5 inches) and extends the wheelbsase (58.4 vs. 58.2 inches). The long-travel suspension soaks up bumps very well without bottoming, though the only adjustment is rear preload. The Sertão also has more ground clearance (9.5 inches laden) and a 2.4-inch taller seat height (33.9 inches), though the seat-peg relationship is unchanged so there’s no additional legroom when seated. The seat has supportive padding and a grippy surface. We didn’t get a chance to test them, but two accessory seats are available: a tall seat (35.4 inches) and a single seat with lockable luggage compartment. Though knobbies make things a little squirmy, the Sertão is just as much fun on the street as its sibling. A wide handlebar, skinny tires (90/90-21 front, 130/80-17 rear) and light weight with a low center of gravity (fuel is stored under the seat) make it easy to toss around. Those qualities also make it nimble off-road, where line selection and last-second corrections are accomplished with ease. And the big red button on the left handlebar simplifies turning off the ABS for offroad riding. The liquid-cooled, fuel-injected single, good for 43 horsepower and 38 lbs/ft of torque at the chain-driven rear wheel, works hard without complaint or excess vibration. The five-speed transmission shifts cleanly, but I wished for a sixth gear at freeway speeds. Whereas the light-action, cable-actuated clutch’s lever is adjustable, oddly, the front brake’s lever is not. The single front disc brake provides sufficient stopping power with good feel; using the rear brake helps, though the ABS kicks in early. Long stretches of stand-up riding gave me a different perspective on the Sertão. Being 6-foot, 1-inch tall, I had to lean forward and arch my back to reach the handlebar and work the levers, which I rotated downward (Torx wrench required!). If the Sertão was mine, I’d add a set of adjustable bar risers to allow normal height on the street and raised height on the trail. The narrow footpegs made the arches of my feet ache when standing (even with the rubber inserts installed, which I soon ditched for more grip), so I’d swap them for wider ones that pivot. Our test bike included the $300 Standard Package, which adds heart-warming heated grips and a gear-powering 12V socket. Of course, BMW’s accessory catalog is overflowing with farkles. 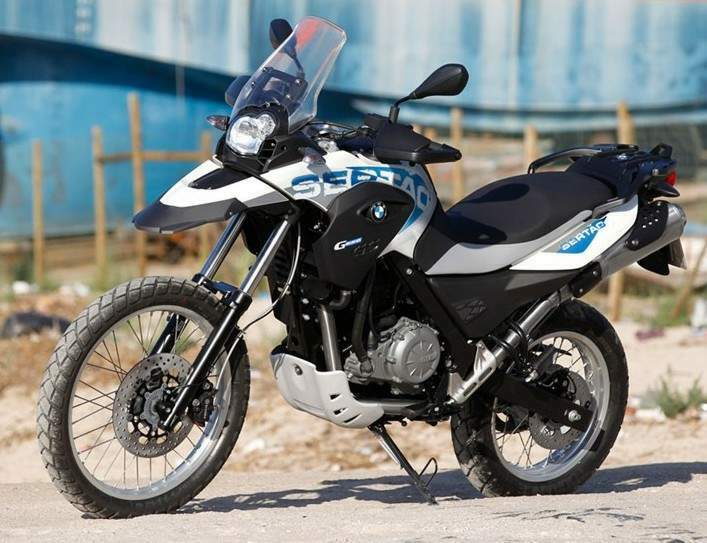 During our test of the base-model G 650 GS we averaged 57.3 mpg on regular unleaded, but for the first 500 miles of the Sertão test we averaged just 49.2 mpg. Even taking into account heavy throttle, heavier test riders and aggressive knobbies, that’s a huge difference. Leery of BMW’s claim that the Sertão yields 74 mpg at 55 mph, I filled the tank, rode 50 miles north on Highway 101 at 55 mph, turned around and rode 50 miles back. And when I topped off again, it had gotten 74.4 mpg! With knobbies! If you want to get 270-plus miles out of the 3.7-gallon tank, ride slowly.